"The rally was so difficult. On Friday, we knew if we were in the top-five or -six we would be really happy. But we also knew this is not the event where the fastest guy wins; it would be the smartest. We managed to do the rally without any issues. It's been a great effort from the team so we're very happy. Now it looks interesting for the championship. We'll keep pushing." / "Byla to hodně náročná soutěž. Věděli jsme, že tohle je soutěž, kde nevyhraje nejrychlejší, ale nejchytřejší. Dojeli jsme do cíle bez větších problémů. Jsme moc spokojeni a šampionát teď vypadá moc zajímavě." "I'm quite satisfied. The main thing was to get second place in the rally. It's great for the team – absolutely fantastic." / "Jsem hodně spokojen. Druhé místo je skvělé a také celkový výsledek pro tým je skvělý." 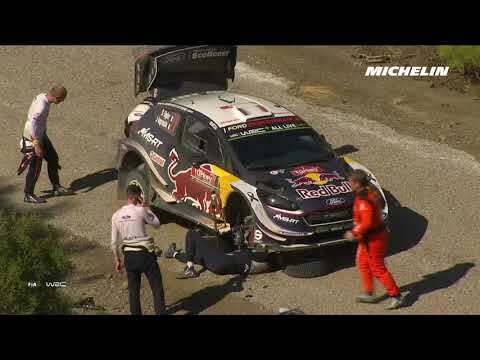 " Filter: Sun 14:29 - Tänak reaction The rally was so difficult. On Friday, we knew if we were in the top-five or -six we would be really happy. But we also knew this is not the event where the fastest guy wins; it would be the smartest. We managed to do the rally without any issues. It's been a great effort from the team so we're very happy. Now it looks interesting for the championship. We'll keep pushing." "I'm quite satisfied. The main thing was to get second place in the rally. It's great for the team – absolutely fantastic." "Really happy to be on the podium for the first time this year. It's been a tough rally and weekend for the team." / "S prvními letošními stupni vítězů jsem opravdu spokojen. Byla to náročná rally." "It's been a great weekend. My first target was to try and manage the car and I did. We need some more pace to fight for the podium next year." / "Dobrý víkend. Mým prvním cílem bylo šetřit auto a to jsem dělal. Ale abych mohl příští rok bojovat o pódium, tak potřebuji zrychlit." "It was very important to take the manufacturers' points and not risk anything. I took it very safe and drove clever." / "Bylo velmi důležité získat body pro tým, takže jsem neriskoval." "It was completely flat out. I knew there was not so much we could do because I think we are missing some pace but I did everything I could do with a puncture on the rear left. " / "Bylo to úplně naplno." "One of the toughest rallies I've experienced during my career. It wasn't easy but this is part of the game." 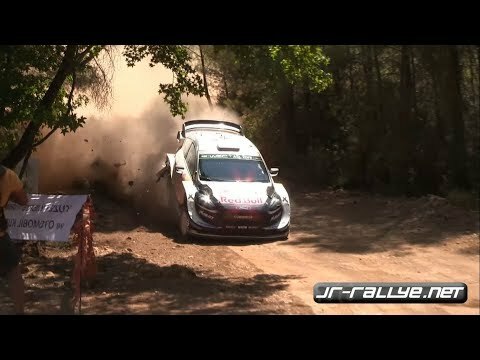 / "Jedna z nejtěžších rally, co jsem kdy jel." "That was absolutely flat out. We are fighting for the championship with some hard guys to beat but we deserved the win to be honest. We were leading the rally and were by far the fastest. But a small issue meant we stopped. I'm disappointed for the whole team but we win together and we lose together." / "To bylo úplně naplno. Vítězství jsme si tu zasloužili. Vedli jsme, ale kvůli maličkosti jsme museli odstoupit." "The driving wasn't so bad but it was more slippery than expected. I think it's a positive end to a quite disastrous weekend." / "Jízda nebyla špatná, ale klouzalo to víc než jsem čekal." "We had some good luck and some bad luck here. But that's five wins in a row this season and the title is really close." / "Měli jsme tu štěstí i smůlu. Ale je to páté vítězství v řadě a titul je na dosah." "We are really happy. It was a really hard rally with difficult stages for us and the car. I'm quite happy with our pace and the result." / "Jsme moc spokojeni. Pro nás a naše auto to byly náročné zkoušky." "It's been an unbelievable experience. It's my first WRC event in an R5 car so to do this is incredible. The strategy paid off!" / "Byla to neuvěřitelná zkoušenost. Moje první soutěž v MS s vozem R5, takže je to úžasné."